Following this, on one Vodafone store in London, we now note this, on a lot of them. P.S. we didn't organise this! It seems to be something rather, er, spontaneous. People are beginning to get annoyed about all these tax shenanigans. Get a flavour of the strength of public feeling in the UK here. Ordinary people on the street explaining exactly what tax justice is all about. 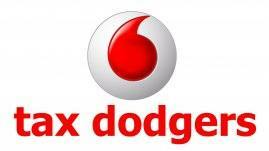 Update: there was an Attac protest about Vodafone's tax tricks in Germany in 2004. For those who speak German, click here. Hat tip: Detlev von Larcher.